Failure Analysis Root Cause Determination – Matergenics Inc.
Failure analysis is the method that is used to determine the root cause of failure when products, components, assets, or systems fail to meet performance expectations. The findings of a root cause failure analysis provide decision makers with the tools they need for remedial actions and preventative measures to be taken. At Matergenics, our diverse engineering team of Ph.D. level scientists, NACE certified engineers (materials, metallurgical, corrosion, mechanical), and chemists can assist you with your root cause failure analysis needs. Areas of specialization include the steel making, manufacturing, aerospace, automotive, oil and gas, electric power, telecommunication, and wind tower industries. Above, is cracking of a load bearing steel member on a 500,000 kv Transmission line. Although Matergentics materials testing work is vital to its clients, it is rarely seen by the public. Here are some examples of recent projects in which our experienced Matergentics engineering team provided the timely, competent, customer-oriented engineering analysis that made the difference. Metallurgical testing for a major commercial airline fleet that includes failure analysis investigations, corrosion investigations, and quality control testing. Same-day metallurgical failure analysis of the effects of a truck fire on the superstructure of a major highway bridge to determine whether or not the highway could remain open. Failure analysis of a gas main explosion that caused causalities. Failure analysis and remaining life determination of boiler components in the power industry. Electrochemical corrosion evaluation of implant materials such as hips, knees, stents, etc. to improve products and performance. Ultra-high vacuum chamber for analysis of coatings and materials surfaces. R&D of coatings and sensors for the construction industry. At Matergenics, we determine if a failure is due to material selection, design, fabrication or operating conditions. Major corporations that rely on Matergentics specialists expertise include airline industry the Steel Industry, Electronics, Power Plants and many more. These investigations require not only a modern laboratory but an extensively trained professional team as well. Above, photo showing fracture through weld metal and heat affected zone. Components such as pipeline, boiler tubes, forgings, mechanical equipment, wire cables, concrete, pressure vessels, castings, welds, tubing, gears, FRP/PVC pipe, tools and dies, bolts, electronics, engine components, brakes, implants, transmission and distribution structures, telecommunication towers, and electric power components are routinely tested at Matergenics Materials Testing Laboratory. A note about submitting samples for testing. For precaution purposes, prior to sample submittal photographic documentation of the failed section prior to its departure from the project/accident site and upon its arrival at the Matergenitics materials testing laboratory should be made to ensure any damage from mishandling is appropriately noted. Before the shipment of the failed section, proper preservation techniques for the fracture surfaces and the section (including coating), if required, should be identified and a chain of custody should be established for transfer of the failed section to our testing facility. Additionally, before the failed section arrives at Matergenics, it should be determined if destructive testing of the failed section has been approved. Only non-destructive testing is allowed in some instances to preserve the samples (e.g. pipe) intact for evidentiary purposes. In some instances destructive testing can only be performed when all interested parties agree to its necessity and a consensus protocol can be crafted establishing those that can witness the destructive tests. In corrosion failure analysis of pipe lines and underground assets or process plants, besides a metallurgical analysis of the pipe/component, the internal and external environment of the line pipe must also be considered to arrive at the causal factors that may have caused the line pipe to fail. Therefore, the presence of corrosion products inside and outside the pipe line in the area of the failure must be considered and collected for analysis, as appropriate. For example, soil in the immediate area of the failure, dislodged soil adjacent to the ejected pipe, and soil that had adhered to the line pipe may have to be collected for analysis. Below are photos of past projects including (1) an above ground storage tank with corrosion pitting and metal loss; (2) a section from a cast iron pipe with graphitization; and (3) a electric power utility structure with internal and external corrosion, metal loss and perforation. Photo of an above ground storage tank with corrosion, pitting, and metal loss. Photo of a section from a cast iron pipe with graphitization. The following case histories present a wide range of applications of the techniques for failure analysis outlined in the fore-going protocol. They are selected from the hundreds of cases that have passed through the authors’ laboratories over the past thirty years. 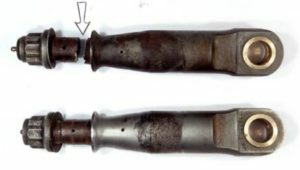 Both halves of a broken steel pin were submitted for examination. The sample was identified as Left Hand Main Landing Gear, AC 809. At a later date an unbroken pin identified as Right Hand Main Landing Gear, AC 809 was also submitted. We were asked to determine the mode, not the cause, of failure. The two as-received pins are shown in figure 1 where an arrow shows the location of failure. 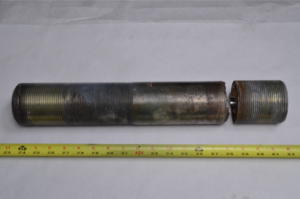 The failure occurred in a 1.230-inch-diameter cylindrical part of the pin which was corroded on the outer surface. One side of the fracture surface is shown in figure 2, below.Convergent chevron patterns identified the fracture initiation site on the outside surface. The fracture initiation site is marked by a red arrow in figure 2. Most of the fracture surface had been darkened by corrosion. A series of coarse low cycle fatigue crack arrest marks was identified at the ends of the two discolored crack-propagation fronts. The exterior surface of the 1.230 inch diameter cylindrical part of the pin contained corrosion pits. Corrosion pitting was also visible at the fracture initiation site. The fracture surface profile is shown in figure 3. 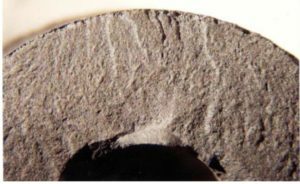 A circumferential ridge and depression were found in the cylindrical surface. A similar ridge and depression were seen in the unbroken pin. By comparing the cylindrical parts of the two pins it was found that the fracture of the broken pin had initiated at the circumferential depression.The part of the fracture surface containing the fracture initiation site was macroetched for 30 seconds in a hot aqueous 50 percent hydrochloric acid solution to remove the corrosion products. The clean surface showed the fracture initiation site, as seen in figure 3. A transverse cross section through the fracture initiation site was prepared for metallographic examination. The fracture surface profile is relatively flat. No crack branching was seen. 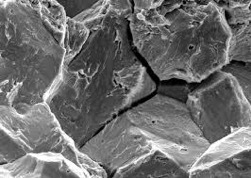 The microstructure consists of dark-etching tempered martensite. No gross plastic deformation was observed at the fracture initiation site. 50 high-strength, low-alloy steel, a common structural material in welded, bolted or riveted structures such as buildings and bridges. 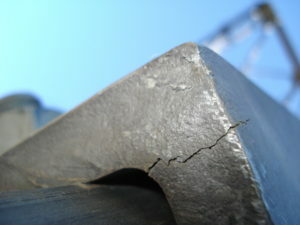 Such a crack is considered detrimental to the service life of the material and if left untreated, the crack could propagate under adverse conditions. An on-site metallurgical inspection was carried out to determine the condition of the column. The paint was removed from the area in which the cracking was first detected. The large crack, as well as several smaller vertically aligned cracks were found near the center of the flange face. The widest and most pronounced crack measured 10-15 mils wide with a crack depth of 0.35”. The paint was also removed from the opposite flange in the same area for additional metallurgical inspection. A number of short vertical cracks were found that had not been not visible through the paint. A dry magnetic-particle test was performed on both flange surfaces. When finely divided magnetic particles are applied to the surface of a sufficiently magnetized ferromagnetic material, the particles will concentrate in cracks or other discontinuities in the surface. This procedure makes it possible to inspect a surface for cracks visually without damaging the sample, a vital consideration since the column could not be damaged in any way by sampling. Concerns about the integrity of the column prompted the investigators to perform on-site hardness testing. Both column flanges were tested in several crack regions. ASTM A572, the specification for the grade 50 steel in the column, does not specify a hardness requirement but it does specify a minimum tensile strength of 65 KSI. This value corresponds to an approximate Rockwell B scale hardness of 74 HRB. The measured values met or exceeded this value. Since the column met hardness requirements and had a normal microstructure, it was concluded that the cracks in the flanges of the steel column were likely to have been produced during hot rolling stage of production of the beams. Because the major crack might propagate under adverse conditions, it was recommended that it be removed by grinding and that the column then be repair welded. The necessary repair work was to be performed by competent welders in accordance with AWS Specification A5.1. It was further recommended that all of the column flanges in the structure be subjected to one hundred percent ultrasonic inspection to determine if any other cracks exist. Please do not hesitate to call Matergenics at 412-788-1263 or Dr. Zee at 412-952-9441 if you have any questions, concerns or need technical information.